There is nothing quite like sharing your snacks with other folks, unless you are one who prefers to hoard everything and keep all of the sweets to yourself. If you have a sense of humor, then you can settle for the $17.99 404 Error Snack Tray, and you will be able to let the snack tray inform others that the appetizers you are looking for could very well have been removed, eaten, or fallen on the floor. 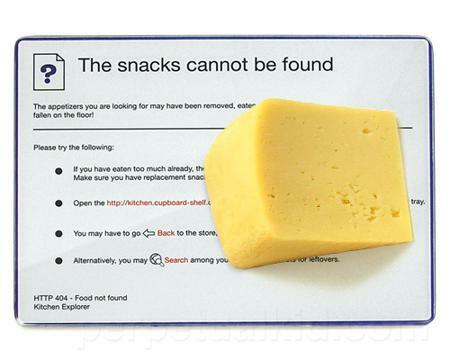 “HTTP 404 – Food not found. Kitchen Explorer error.” is something that is certain to tickle the funny bone of even the most stoic person. All you need to do is slice, dice and serve your food on a single platter.